Andy & James have been hobby charcutiers for several years. Andy grew up on a pig farm and James is a member of a small village cooperative of 6 families who raise livestock. Their daughters become best friends at the local school and it wasn’t long before they discovered that they shared passion for curing meats and making salami. Over a pint of cider at a local lawn-mower race (this is Somerset! 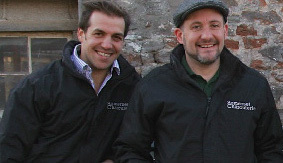 ), the idea for a quality British Charcuterie business was conceived. Both of them have run their own food businesses for several years and could see an opportunity to develop a range of products that followed traditional Spanish, French and Italian methods but were adapted to the British market and capitalised on the rich food culture of the South West.